Monday, Tuesday, Thursday & Friday: 8:30 a.m. - 4:30 .pm. Find this location on Google Maps. Our Centre in Burlington has a variety of offices, meeting and training rooms and computer lab space available on either a short-term rental or longer-term lease basis. Free Wi-Fi is available in all of our rooms. For information on renting or leasing space, please contact us at alison.pereira@centreforskills.ca or 905-333-3499 x 245. Free Wi-Fi is also available – see a Centre staff person for assistance. Monday, Tuesday, Thursday & Friday: 8:30 a.m. - 4:30 p.m.
Inclement Weather: In the event of bad weather, Centre policy is to follow the direction of the Halton District School Board (HDSB) and be closed when schools are closed. This information will be broadcast on local radio stations and updated on HDSB and Centre websites. 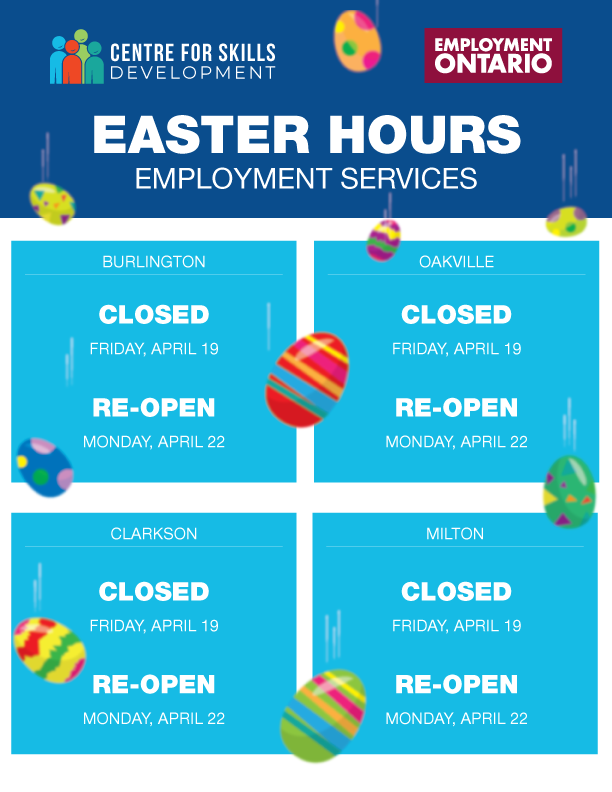 Tuesday to Friday: 8:30 a.m. - 4:30 p.m.
Our Centres provide an Employment Advisor at the Acton Library Tuesdays, from 9:30 a.m. - 4:30 p.m. Free job search assistance including defining career goals, resume and cover letter help, and interview preparation is available by appointment. A Settlement Specialist is at the Halton Hills Public Library – Georgetown Branch every Thursday from 1:00 p.m. to 4:00 p.m. Get help with your questions about settling into the community. Settlement Information Specialists can answer questions about banking in Canada, immigration, child care, getting a driver’s license, health care and finding employment. They can also provide Commissioner of Oath services. The Centre provides ESL/LINC classes every Monday, Tuesday and Wednesday from 9:00 a.m. - noon (12 p.m.) and evening classes from 6:30 p.m. - 9 p.m.
Our Milton Centre has ample free parking. 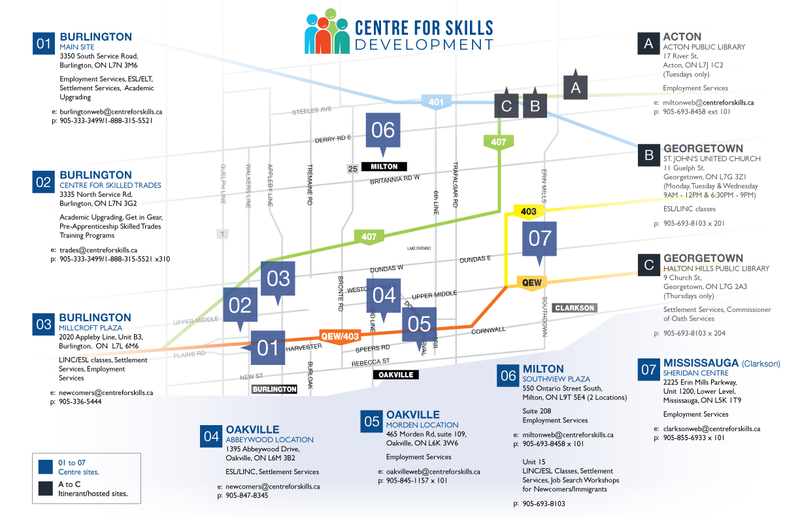 This location provides local and area residents easy access to Centre employment services programs and other education, training and human development organizations. Free Wi-Fi is available for Centre clients – ask a staff person for assistance. Free Wi-Fi is available for Centre clients – ask a staff person for assistance. Hours of Operation: Monday to Friday: 8:00 a.m. - 4:00 p.m. Location: The Morden Road location is one block west of Dorval Drive and just north of Speers Road. The site is easily accessible from the QEW or Oakville Public Transit. Free Wi-Fi is available for Centre clients – ask a staff person for assistance. Monday, Wednesday, Thursday & Friday: 8:30 a.m. - 4:30 p.m.